Special thanks to: Leia Tyndall, a descendant of Joseph M. Kasson (Para. 3.b.(2. of generation 4, below), who has done a lot of work on her family's history, some of which is on display in this annex, but which can be viewed in greater depth and breadth at http://www.ancestry.com/. Born about 1681. Died 17 November 1752. Emigrated from Ireland to America in 1722. Employed as a wheel wright. Born 1682. Died 31 March 1767. Emigrated from Ireland to America in 1722.
b. John Kasson: Died 1776. Married widow (?) (?) Barrett. c. William Kasson: Died 16 November 1760. Married Elizabeth McKay (d. 13 Nov 1760). d. Adam Kasson, Esq. : Born 1709. Died 18 July 1799. Married Mary Harvey (d. 7 Dec 1775 at Coventry, Kent County, Rhode Island. e. Thomas Kasson: Born 1713. Died March 1750 at Voluntown, New London, Connecticut. Married Alice Gibson (d. New Marborough, Berkshire Co., MA). f. James Kasson: See generation 6, below. g. Archibald Kasson: Born 1717. Died 1 March 1800.
h. Samuel Kasson: Born 1719. Born November 1714. Died 5 July 1791. Trained as a wheel wright. Born about 1700; daughter of George and Margaret (Cross) Duncan. Died 26 September 1757, age 57. Married James Kasson on 14 October 1740. (2. Jean Kasson: Born 7 August 1743. Died 11 October 1757. (3. Sarah Kasson: Born 20 August 1745. Died 6 October 1804. Married Solomon Guernsey (d. 5 Jan 1789) on 15 November 1764. (4. James Kasson, Jr.: See generation 5, below. (5. George Kasson: Born 21 February 1750. Died 9 October 1757. (6. Adam Kasson: Born 20 April 1752. Died 24 June 1754. (7. Esther Kasson: Born 20 May 1755. Married Luke Steele. Born about 1731. Died 23 February 1811. Married James Kasson on 8 June 1758. (1. Jane Kasson: Born 10 June 1759. Died 25 September 1837 at Barre, Orleans County, New York. Married Darius Butler (b. 1760, d. 12 Feb 1812). (2. Olive Kasson: Born 3 September 1761. Died 8 October 1816. Married Elizur Wheeler (d. 5 Nov 1815 at Windham, Green Co., NY). (1) John Adam Kasson: Born 11 January 1822 at Chittenden, Rutland County, Vermont. Died 18 May 1910. Married Caroline Eliot on 1 May 1850. (a. George Myron Kasson: Born 19 May 1803. Died 13 May 1893. Married Lucretia Mason Turner (b. 8 Apr 1811, d. 9 Jul 1887). (5. Mary Ann Kasson: Born 19 February 1768. Died 1837. Married Gideon Leavenworth. Born 18 June 1748. Died 27 January 1803. Employed as a wheel wright. Veteran of the Revolutionary War; was a clerk under the command of Captain Thomas Bull and Major Sheldon of the light Horse [Dragoons]. Born 6 January 1750; daughter of Jethro and Martha (Clark) Hatch. Died 24 July 1839. Married James Kasson on 16 January 1771 in Kent County, Connecticut. (1. Jabez Hyde Kasson: Born 1820.
b. Clarissa Kasson #1: Born 11 February 1775. Died before 1789.
c. Lydia Ann Kasson: Born 17 December 1776. Died about February 1778.
d. Clarinda Kasson: Born 29 January 1778. Married Charles Prentice (d. Canaan, CT). 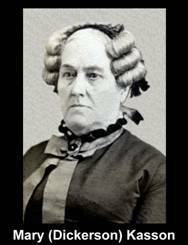 e. Lydia Kasson #2: Born 8 December 1779. Died 1866. Married Nathaniel Hall on 29 January 1817.
f. Adam Clark Kasson: Born 28 July 1782. Died 18 January 1861. Married Sally Parmelee (b. abt 1783, d. 12 Jun 1860) on 27 Nov 1818.
g. James Hatch Kasson: Born 12 May 1784. Died about 1815.
h. Esther Kasson: Born 26 May 1786. Married Archibald Dixon. i. Clarissa Kasson #2: Born 25 April 1788. Died 26 December 1805.
j. Joseph Milton Kasson: See generation 4, below. k. Reliance Kasson: Born 11 January 1793. Died 10 October 1862. Married Federal Brinsmade (b. 7 Jul 1788) on 22 February 1815.
l. Theron Kasson: Born 16 November 1795. Died 27 June 1803. Born 4 June 1790. Died 18 May 1866 at Syracuse, Onondaga County, New York. Born 23 March 1794. Died 20 May 1827. Married Joseph Milton Kasson on 14 May 1812. (1. Nathaniel Gray Kasson: Born 18 July 1813. Died 27 January 1878 at Welaks, Florida. 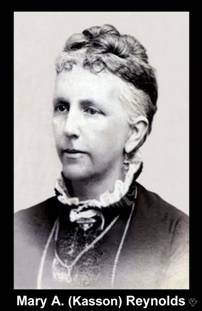 Married Emily L. Cates (d. 1 Feb 1881). (2. Clarinda R. Kasson: Born 5 June 1815. Died 16 July 1824. (3. James Hatch Kasson: Born 16 February 1817. Died November 1872. Married Mary S. Robbins. (4. Lydia Clarissa Kasson: Born 23 February 1823. Died as an infant. Born 5 October 1805 (also seen: 1804). Died March 1879. Married Joseph Milton Kasson on 7/6 January 1830 at Baltimore, Maryland. (a. Francis K. Thorn: Born about 1853. (b. Charlie Thorn: Born about 1856. (a. Sybil A. Kasson: Born 16 November 1869. Died 2 November 1948. Married Arthur L. Stark (b. abt 1870) on 12 September 1893 in Cuyahoga County, Ohio. (a) Daughter: Married John Niles Beeckel (b. 8 Feb 1928, d. 16 Mar 1967) on 22 July 1952 at Park Ridge/Hackensack, New Jersey and had children. (b) Anne Louise Anderson: Born 5 August 1931 at Hollis, Queens, New York. Died 24 December 2010 at Wilmington, New Hanover, North Carolina. Married (?) Jones and had children. (3. Mary A. Kasson: See generation 3, below. (4. Lydia Hannah Kasson "Hannah": Twin. Born 24 January 1837. Married (?) Squires. (5. William Stokes Kasson: Twin. Born 24 January 1837. Died 3 August 1839. (6. William Otis Kasson: (photos) Born 23 June 1841. Married Sophronia Hayden of Iowa. (7. Arthur Lewis Kasson: Born 15 September 1849. Employed as a druggist at Phoenix, New York. Note: One of Mary A. (Kasson) Reynolds' brothers was a veteran of the Civil War who, for a period of time, was an inmate in the infamous confederate prison at Andersonville, Sumter County, Georgia. Born 23 February 1834. Died February 1911. Married Captain Abram Reynolds, generation 3 of the Reynolds Annex on 21 October 1852 at Syracuse, Onondaga County, New York.